Been working on lots of round things lately, and found myself getting annoyed with "follow me", and the other similar plugins I have - mostly because they always destroy the arcs and curves that I'm following around, which makes later editing fiddly. - No need to construct a circle to follow - you just need an axis line. - Multiple faces can be lathed in one pass. - The arcs/circles of the lathe paths remain intact, for easy editing using the 'cardinal points' etc. - No nasty 'follow me' end points when you only lathe an arc. - Re-orients inside out solids (only for "capped" solid forms so far - needs work). - Choice of end-capped or open forms for arcs. - Perpendicular terminated arcs option. - Download the .rbz file. - 'Plugins' menu -> Install -> RBZ Package, and navigate to the file. - Confirm the popup box. - Too much to include here any more - see the .pdf download (this will be improved, just a draft at the moment). V1.0.1 - 24mar2013. Fixed a bug where the lathed form moved from the profile position if the profile was not in contact with the axis line. V1.1.0 - 29mar2013. Component creation, end cap options added. Code re-factoring. v1.1.1 - 29mar2013. Re-versioned as v1.1.0 was the wrong file with some de-bugging code still in place. v1.2.0 - 31mar2013 Negative angles and non-coplanar faces now handled correctly. Improvements to 'front-face' correction. Free to use, copy, distribute or modify so long as the author attribution remains in the code. No warranty! - I've tested everything I can think of on my system, but I can't guarantee that it will behave for you - let me know if you think it's doing anything it shouldn't, and I'll do my best to get any bugs fixed. Last edited by Trogluddite on Sun Mar 31, 2013 11:56 pm, edited 8 times in total. Very cool! thank you. I like that it leaves the "hoops" welded and straightens out the ends. That'll make it a lot of things faster. One thing I find curious is that the lathed shapes can get moved from the original location of the profile. The upper shape was turned from the profile shown in green. The plugin put it up above the other lathed shape. Both line up with the near end of the line. Thanks for spotting that so quick and getting back to me. Version 1.0.1 is now in the top post - hopefully with my X's, Y's, and Z's calculated properly this time! That seems to have dine it. Thank you. Thanks everyone, glad to hear you're liking it! Steve, now the requests are going to start. Any chance of getting the plugin to create components instead of or in addition to groups? That would be even better for my work flow. One of the ways I would use this is to replace Follow Me for this sort of thing. For complex turned parts I like to quarter them. It results in less geometry to deal with when drawing and cleaning up around the pommels and it helps to keep file size lower. I make a component of the quarter and save it for future use. Sometimes I want just half a leg or a 3/4 leg for a kitchen island and they are easily made from these quarters. Dave R wrote: Steve, now the requests are going to start. He he, yes, I've seen the outrageous way you all treat TIG, ThomThom, Dan etc., you greedy blighters! Dave R wrote: create components instead of or in addition to groups? Actually, I already had just that feature in mind - I work on a lot of mock-ups of control panels etc. so this is to be part of my little toolkit for designing knobs and dials. In fact, it's partly where that bug came from - trying to get the group axis/origin located consistently so that the components could also glue to a face. I'm just working on a little addition at the moment that gives a clear indication which way the axis line is pointing, and the option to reverse the direction. I usually use the 'trim template from a rectangle' method to make profiles, and it's 50/50 whether the component ends up upside down when you choose an existing edge - which rather spoils the effect! Very good plug. Thank you. Nice plugin and thanks for your work. Noticed, since coplanar faces are not removed or even given an option to remove coplanar faces, after lathing, you can not push/pull what should be a face, i.e. the end of a pipe. I found this out be doing a lath, that should have made a section of piping. However, when I wished to make the pipe longer, I couldn't push/pull the ends. Again thank you for your time and effort. Love it, Multiple on same axis excellent, nice clean and simple to use. But my rings seem to be exploding. As you can see from the pushpulls in the pic. It also seem that if I recurve or weld the the ends of the extrusion, it will still break up when PPed. If I copy the profile away from the extrusion it retains the weld. Wow, so much interest, I am very flattered. @Dave - ah yes, didn't see your pic's before. That's just what I had in mind when getting rid of the follow-me "end mess". Might be an idea also to have an option to remove the "end planes" of the extrusion too, as they would just become useless internal faces when duplicating the segments. @Ken - definitely add that to the 'to do' list For my own intended application I left the 'facets' on co-planar faces as I often want to modify the face later - but I can see how that would not be expected for other applications. @Box - interesting; again I think probably a case of me being a little blinkered by my own intended use (kind of more like Dave's wood turning examples). The circles/arcs that go around the lathe axis stay 'welded', which was my intention, but I hadn't considered the case of the initial 'profile' face being an arc or curve. Would never have thought it was in that direction. Perhaps a choice of one way or the other is possible. Steve, if you are going to modify the plugin for those quarters as I showed, may I suggest that you also see if you can work in a way to get the first and last segments in the extrusion to be perpendicular to the ends of the extrusion? Here's an example where I've set that up for a turned leg. The segments marked in red are perpendicular to each other. These would be the first and last segments for a quartered lathed shape. I normally set up these types of things that way so I can avoid the shadow line at the seam as you can see in my example in my other post. As to getting rid of the profile faces, that would be a nice option although it isn't difficult to do manually. Of course for something like my table leg or your knobs, those faces aren't required. the main reason I remove the faces is so it won't show through at the seam lines. You made a very good one here, be proud of you. gilles wrote: You made a very good one here, be proud of you. Thankyou Gilles, it's been very satisfying to make something useful - and of course, we must not forget all the other kind and generous people here who made it possible for me to learn all these things. Yes, it looks like it will have to be done that way - I made a little test rig to try putting the welded curves the other way, and bar a few minor bugs, that works OK. But whatever I do, SU won't let there be welded curves in both directions at once - I tried it using some of the other welding and recurving plugins, and it seems that the geometry just isn't allowed to work that way. So it will have to be an either/or thing. Hmm, i hadn't considered that, but i know what you mean, it does kind of spoil the appearance when you get those unsmoothed joins. I'll have tinker and see how likely it is once I've tidied up a few other things - the code is getting a little unmanageable with all this "feature creep" going on, so I need to get everything nice and structured so I can see the wood for the trees. PS) Just about there with the co-planar faces thing, so maybe a minor update coming soon just to get the low hanging fruit picked off. Version 1.1.0 now available in the Top Post. - Co-planar faces can now be merged. - Can now make components as well as groups. - New features added for making arrayed component 'segments' which will join seamlessly, including perpendicular end-caps (as per Dave R's examples in above posts). 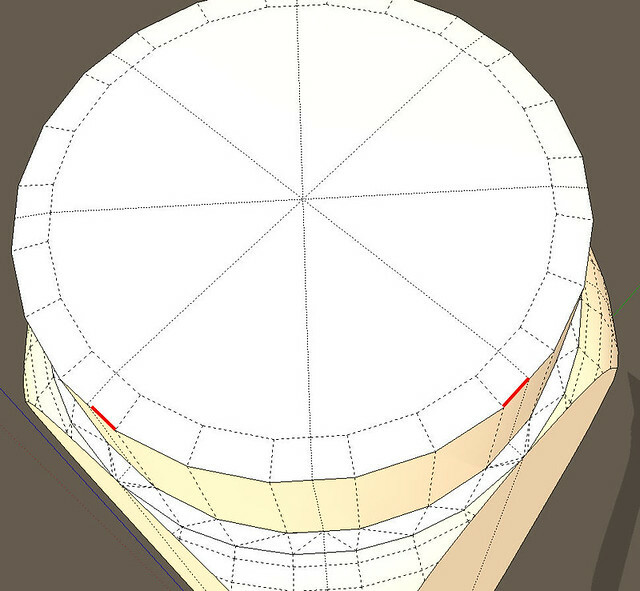 - Face orientation correction only works 100% for closed solids ("capped" arcs and 360deg lathes). Sure this is fixable. - Extrudable end caps - losing co-planar edges makes push/pull possible now, but still working on making them 'smooth aware' for when circles and arcs are extruded. Ooops' apologies to whoever just uploaded - that wasn't the right Ruby file. Re-upped! Last edited by driven on Sat Mar 30, 2013 12:02 am, edited 1 time in total. Just select the face WITHOUT its edges and a line for axis. Does it possible to have the End caps as a new selection ? And a negative angle (or similar) for have a continuous second form etc...! In this case the "new selection" will make a "return" with the new axe! Cool!! I don't lathe that often except for coffee, but this one was clever. Thanks for the reports and kind words - good to know that it is (mostly!) working! Hi there - there was a damaged file for the download - I replaced this very quickly, but saw that one person downloaded the bad file. Maybe this person was you? Please try with the newest file (v1.1.1) in the top post - if this one is also broken for you, then let me know, and I will see if I can find the problem. Pilou wrote: Does it possible to have the End caps as a new selection ? Hi Pilou - yes, negative angles can be made possible. I avoided negative angles before because it made shapes with a mixture of front/back faces - but with the new code, I will be a able to make this work with a simple transformation. Selecting "follow-on faces" is difficult at the moment because the end faces can be in different groups - but maybe by moving the original selection it could be done. I think first, I will work on the user interface - already the options are becoming untidy, so I think it needs a proper tool (e.g. rotation arrows for the selection, like in your picture) to make the tool operation more clear. jolran wrote: A quick question LOCAL_X. Cant You just use X_AXIS ? He he, a "Doh!" moment! I didn't see the 'X_AXIS' etc. constants before - thanks for the tip, that will be very useful. Yeah, it doesent say so in the API. I think it was TIG who told me last year or so. In the case of Geometry is enable and not Group or Component ! And as you have several volumes the orient face just work for ONE volume! So very, very tiedous when have thousand of volumes!!! Else very funny when the successive selection will be made! Some sinuous volumes will be made! (in mode Geometry enable) And think to erase the internal faces! And it's a little pity that the axe must be coplanar and not with any orientation! I don't see not very big differences on the calculation! Just a quick note. If the version number in the plugin forum is V1.1.1 than the version number in the rb file should be the same. The version number in the download is V1.1.0. This just makes it easier for multiple upgrades, one can be sure he is operating with the newest version. And this from a very grateful user of your plugin who is incapable of writing one line of code. Again thank you for this plugin. Since I model from ACAD/DXF files, I find this a very useful plugin.